So now I have a smattering of components that have cost me less than a tenner, the question is what I can do with them in the form of a project. Immediately I go searching the internet for massive and complex projects, such as weather systems and security keypads, but it is only right that I start somewhere simple. You can get much simpler than a blinking light so this is the way I go. Of course it would help to know much ore about how electronics work. While I feel I already have a rudimentary understanding of electronics, it never hurts to have a recap. I’ll be paraphrasing some of my findings as i go along, but Intructables have a great blog post here to get anyone started. The Arduiono site has a wealth of tutorials so i’ll be following the first of these tutorials, which is the ‘blink’ lesson. The only difference is that I am using a breadboard and extra leads to make the process a little more clear and easier. To make a blinking LED you don’t even need anything other than the Arduino itself, as the Arduino has a number of led status light that can be controlled. 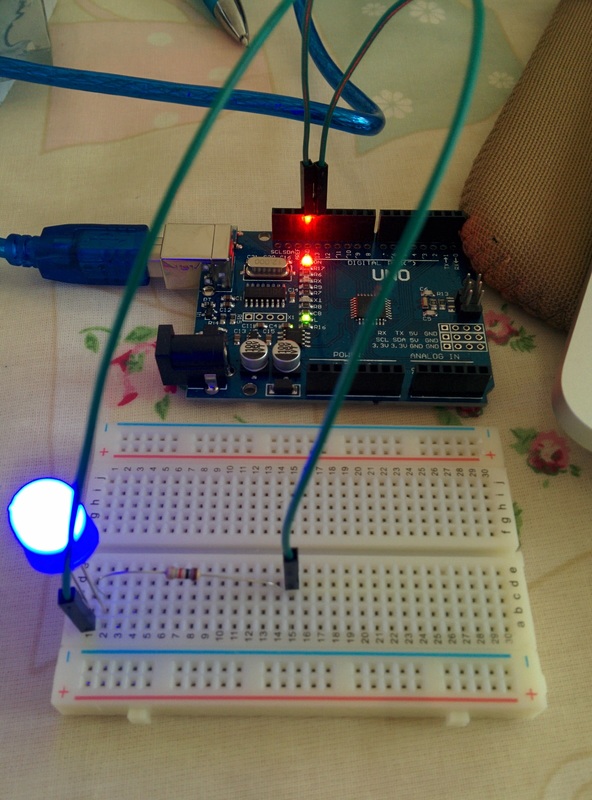 However, as I wanted to create my own closed circuit, I opted to get this code working with an external LED. What this means now is that we have a closed circuit from the Arduino, linking the resistor and the led in the process, to pin 13. We can then use a small program to program pin 13 and therefore control the circuit.